For years, the financial performance reporting options for small businesses have been limited to Generally Accepted Accounting Principles (GAAP) or special-purpose frameworks known as other comprehensive basis of accounting (OCBOA). OCBOA’s appeal is that it allows businesses to use a cash or tax basis of accounting to report financial results. Recently, the American Institute of Certified Public Accountants (AICPA) introduced a new OCBOA called the “Financial Reporting Framework for Small- and Medium-Sized Entities” (FRF for SMEs). Designed to provide a simpler, cost-effective reporting solution for businesses that aren’t required to use GAAP, it blends traditional and accrual income tax accounting methods. The FRF for SMEs addresses transactions encountered by small and midsize, private, for-profit entities, and it shows the business’s profitability, assets and available cash. Companies don’t have to meet specific definitions of a smaller business to use the FRF for SMEs — and use of the framework is completely optional. But if you decide that the framework is appropriate for your business, you can begin using it immediately. The new framework differs from GAAP in several ways. Instead of using fair value as the primary measurement basis, it uses historical cost. Also, the framework isn’t expected to be amended frequently — which can be helpful for small businesses with limited resources. However, the AICPA plans to update the FRF for SMEs when significant developments affect financial reporting by SMEs. Although the FRF for SMEs may provide some appealing features, not everyone is on board with the new framework. The National Association of State Boards of Accountancy (NASBA) initially declined to endorse the framework, instead advocating following GAAP standards for private companies once they’re issued by the Financial Accounting Standards Board. Recently, however, NASBA has agreed to work with the AICPA to help users of the statements understand that reporting under the FRF for SMEs is a viable alternative to GAAP in some circumstances. If you’re interested in using an FRF for SMEs, discuss it with your CPA to determine whether it’s appropriate for your business. If you do decide to use an FRF for SMEs, your advisor will be able to audit, review and compile statements just like GAAP statements to provide credibility and assurance. Traditional to Roth IRA: Should you convert? Traditional IRAs — which can enable you to make tax-deductible contributions and defer taxes on earnings — are popular for a reason. So why would you convert yours to a Roth IRA? You can’t deduct Roth IRA contributions, but withdrawals, including investment earnings, are tax-free if you’re at least 59½ and have held the account for at least five years. You can withdraw contributions free of tax and penalties at any time. Also, Roth earnings are exempt from the new 3.8% Medicare tax on net investment income — although Roth IRA distributions could trigger the tax. Roth IRAs offer estate planning advantages, too. You aren’t required to take minimum distributions (which apply to traditional IRAs), so you can leave the entire balance to grow tax-free. While beneficiaries are required to take minimum distributions from inherited Roth IRAs, the distributions are income-tax-free. Finally, although Roth IRA contributions are limited based on income, anyone is free to convert a traditional IRA to a Roth. But you’ll have to pay income tax on the converted amount and you might trigger the Medicare tax. In estate planning, how you own (or “hold title” to) assets and arrange to transfer them after your death can make a big difference to your heirs. Let’s look at three options. This is one of the simplest ways to hold title to assets. Here the owner of an asset (such as a home) legally agrees to co-own the asset with another party, typically a spouse. When one owner dies, the asset cedes to the surviving owner. This can be an easy and effective way to pass an asset to an heir. However, jointly held property overrides the provisions of a will or trust, and could thwart your other estate planning strategies. Also, under federal law, any Medicaid applicant who has transferred property for less than full fair market value — such as by naming a loved one as a joint tenant with the right of survivorship — during a “look-back” period (typically five years) may be disqualified. But perhaps the biggest benefit of a credit shelter trust is the ability to avoid transfer taxes on future appreciation of assets in the trust. These are only three ways to transfer assets to your heirs. For solutions that fit your unique situation, talk with an estate planning expert. According to the Association of Certified Fraud Examiners, the average business loses 5% of revenues to fraud every year. Smaller companies are particularly vulnerable, suffering higher median losses than their larger peers. One of the things that put small companies at greater risk is a lack of adequate anti fraud controls, such as anonymous tip lines, segregation of duties and background checks. In fact, skipping background checks on prospective employees is like opening the door and ushering fraud right in. To protect your company from legal repercussions, you must — at the very least — verify job applicants’ work eligibility status, in compliance with U.S. Citizenship and Immigration Services rules. And if you’re hiring in certain fields, such as law enforcement, security, trucking, and child care and elder care, you must perform criminal background checks on all potential hires. Verifying previous employment is optional, but important. Contact all references to ensure applicants actually held the positions they claim and that their job performance was satisfactory. Also confirm that applicants have the academic credentials, military service record and professional licenses stated on their resumes. More employers than ever are checking credit reports to learn whether candidates are consistently late in paying bills, are swimming in debt or have filed for bankruptcy. This is critical information to have if you’re hiring someone to work with money. But even if you aren’t, a credit report can reveal something about a prospective employee’s ethics and sense of responsibility. Just keep in mind that financial irregularities might stem from a personal hardship such as prolonged unemployment or illness — so be sure to ask the applicant. While you certainly have the right to know if a new hire is going to harm your business, keep in mind that employees’ privacy and other rights are protected by federal law. The Fair Credit Reporting Act (FCRA), for example, requires that employers obtain signed employee agreements before they request any type of “consumer report” — which covers credit reports, criminal background checks and many other types of information gathering. For a full list of the rules, visit the Federal Trade Commission’s website at http://www.ftc.gov. It’s not always easy or time-efficient to collect background information about prospective employees yourself. Background screening services — with their teams of researchers and instant access to public databases — are a potential solution. Ask other business owners or your financial advisor for recommendations. If you think you’d know an occupational thief if you saw him or her, think again. Fraud perpetrators often are long-tenured employees who are trusted and well liked by their colleagues and supervisors. In fact, most perpetrators have no criminal record. What they do have is motive — commonly financial pressures due to gambling addiction, substance abuse, divorce, illness or simply living beyond their means. And they have opportunity. The majority of frauds occur in accounting, operations, sales, customer service and purchasing departments. Before you begin receiving payments, you need to make sure they’ll end up in the correct account. The default is an account called Undeposited Funds. To make sure that this setting is correct, open the Edit menu and select Preferences, and click the Company Preferences tab.Use Undeposited Funds as a default deposit to account should have a check mark in the box next to it. There may be times when you receive payment immediately, at the time your products or services change hands. In these cases, you’ll want to use a sales receipt. 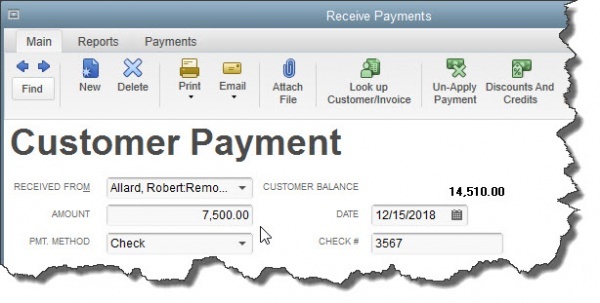 Open the Customersmenu again and click Enter Sales Receipts. Let us help you when such situations occur. It’s much easier -and more economical for you – to spend some time with us before you record a puzzling payment than to have us track it down later on. We’ll help ensure that your money makes it to the right destination.